Yesterday I tried out the lemon facial I'd mentioned earlier as one of my plans for the weekend. Separate the eggs. Whisk in the lemon juice. Scoop out some sugar. Mix in the lemon juice. Wash face. Pat face dry. Scrub face. Wipe scrub off. Steam face. Extract blackheads. Apply mask. Wash off mask. Apply toner. Apply moisturizer. V-WALLA! It took about half an hour and my skin was left feeling fantastic! Unfortunately at the beginning of the routine, I examined my face, and realized... 'my blackheads aren't really out of control right now'. Sometimes, I'll examine my face and immediately go scrambling though my vanity searching for those magical little blackhead strips. But the past little while has been pretty tame in the blackhead area... So hopefully the next time I give this facial a whirl, I'll have some more pronounced blackheads, then I'll be able to comment more accurately on it's beheading capabilities. I did however, have a rather unsightly pimple that I had squeezed the previous evening (I know, I know, I should just leave them alone...), and that was well remedied by this facial. It is now flat, not scabby looking and not painful. In other words, aside from a little red spot where it once was, it's now completely gone! Through this process, I found that I am not a very good extractor. Could be due to the fact that I had minimal blackhead action at the beginning of the process. Could also be due to the fact that having tissue wrapped around your fingers and/or prodding with Q-tips is a very clumsy activity. 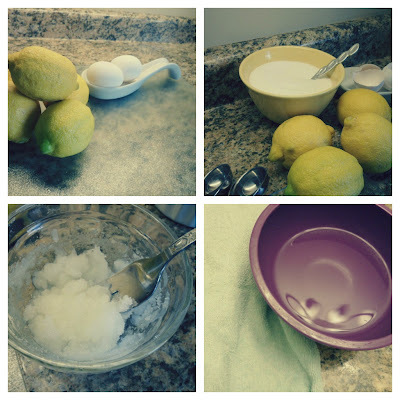 Over all this is a great DIY facial, using ingredients easily found at home. I would certainly do this again, and highly recommend it.